Here's Composite Sketch Of Suspect Wanted In Fatal Shooting Of Bike Rider, 1700 Block Erie St.
(Sept. 28, 2003) -- LBPD says a man riding his bicycle a few blocks northwest of Bixby Park was shot and fatally killed at about 5:45 a.m. on Sunday, Sept. 28 by a man matching the suspect description in the composite sketch to the right. The crime occurred in the 1700 block of Erie St., which runs east-west between 3d and 4th Sts., between Walnut and Hermosa Aves in the 2d Council district. 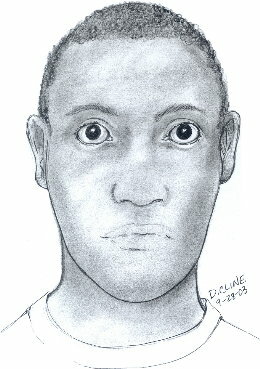 Police describe the suspect as a male African-American, 20 to 25 years old, with a thin build, dark skin, and standing approximately 5'8" to 6' tall. If you see this suspect, don't engage him but do call LBPD immediately at 911. LBPD Public Information Officer Sgt. Paul LeBaron says police responded to a gunshots call and found the victim, a Hispanic man, lying in the street next to his bicycle, struck by gunfire more than once in the upper torso. He was transported to a local hospital and pronounced dead shortly after arrival. LBPD says its investigators learned that the suspect was last seen walking westbound on Erie Street and then fled northbound in a light colored SUV type of a vehicle. Anyone with information regarding this crime is asked to call LBPD Homicide Detectives Richard Conant or Robert Erickson at (562) 570-7244.